The rounded nature of hills, as opposed to jagged mountains, evokes the curves and slopes of the human body. 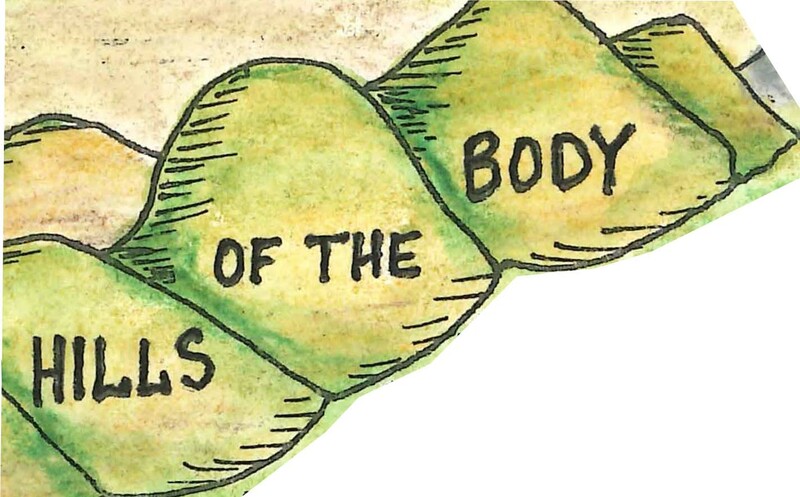 When exploring your inner landscapes it is important to include the “Hills of the Body.” For most people, our relationship to our body is, at times, strained – often because we see the “ideal” body reflected by modern media in a myriad of forms – forms which rarely match our personal reality. In my Inner Geographies class, I have the students spend one week focusing on, mapping, and exploring their connections to their own body. What parts of your body do you like most? What parts of your body do you dislike most? If you were to draw a map of your entire body, what would it look like? What features would you include in your map? If you were to draw a map of a part of your body, what would that part be? What would the map look like? What elements would you include in your map? Here is a gallery of body images. My deepest thanks to the artists for sharing their work.